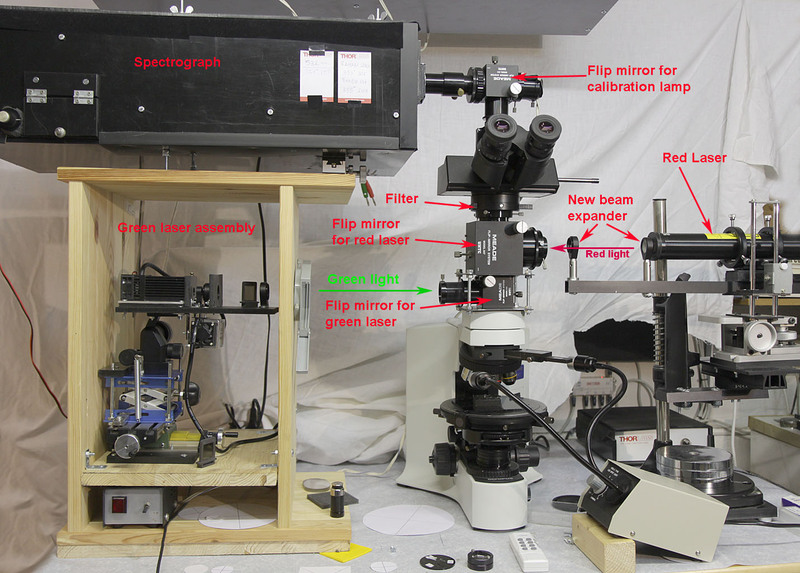 Photograph above illustrates the modifications to the Raman microscope design to add a green laser. The green laser positioning assembly has been placed below the spectrograph on the left of the image. A hole has been drilled in the wooden stand to allow green light to reach the port on the left side of the microscope. 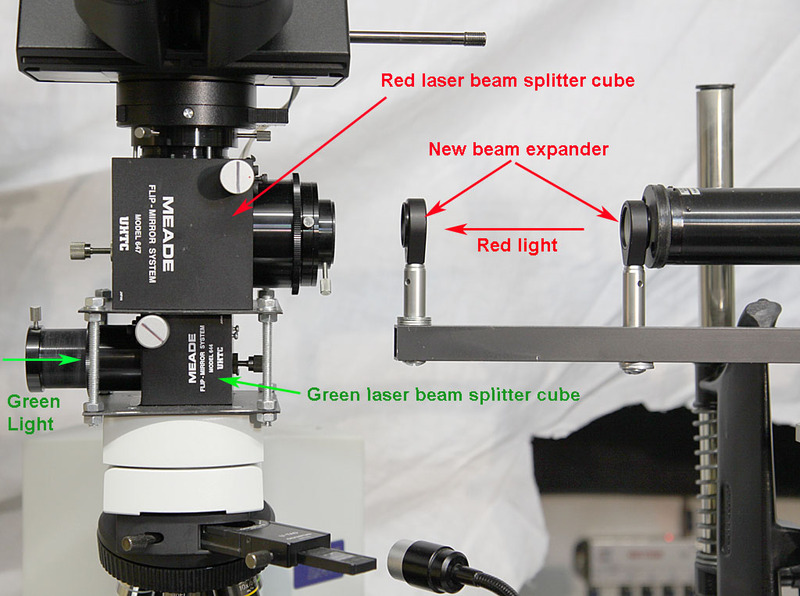 Another modification of the microscope is the addition of a movable beam splitter for the green laser just below the red one. The rotation of the two knobs allow one or the other laser light to reach the sample. Detail of the laser stand. 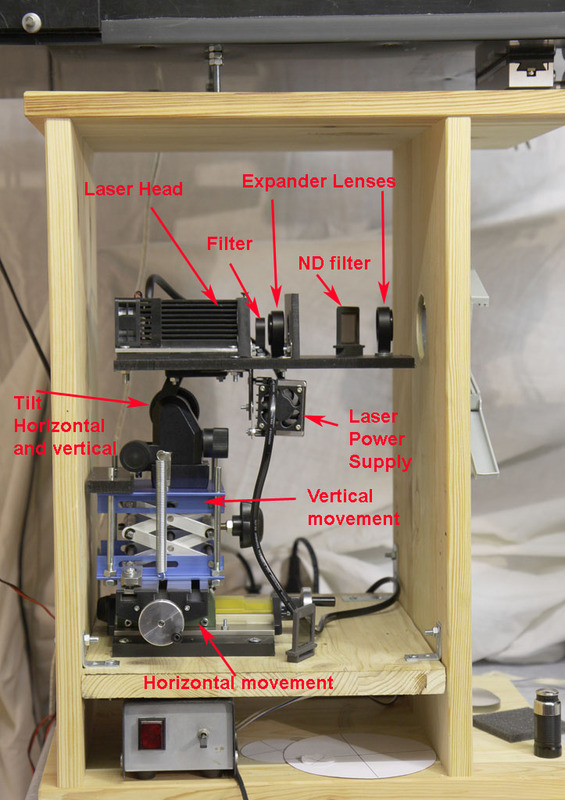 The mechanical assembly allows the laser to be moved in 4 different directions: horizontally perpendicularly to the picture plane, vertically and horizontal and vertical tilts. Horizontal motion is made with a Proxxon XY table. Vertical movement is build with a modified lab jack: 4 guiding bars have been added to the original device, 2 springs, one on each side, prevent any backlash. A photographical tripod head is used for tilting in 2 perpendicular planes. Laser and optical elements are secured on a polyethylene plate on top of the tripod head. Two filters have been placed in front of the laser: one to isolate the laser line and a second one to remove any spurious infrared light, a safety precaution to avoid eyes injury. A new beam expander (3 X) consisting of 2 lenses, one concave (f= -50 mm) and one convex (f = 150mm) has been constructed. 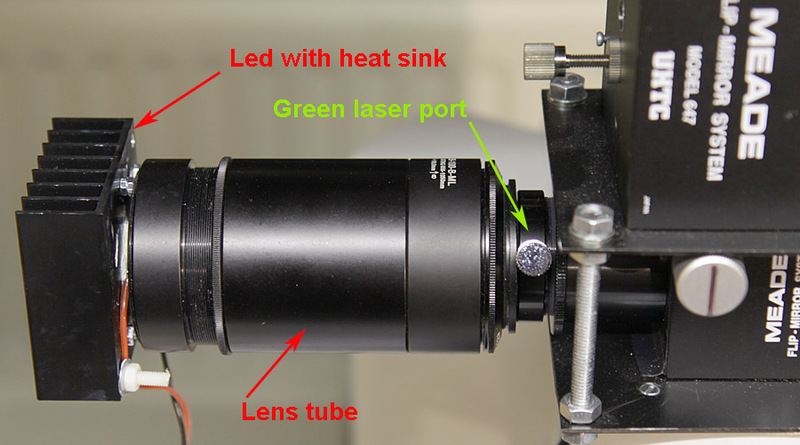 This simple optical device improves the focusing of the laser beam in the microscope object plane. Details of the two beam splitter cubes. The 2 rotation knobs can remove the mirrors from the optic axis of the microscope. The beam expander for the red laser has also been replaced by the simple two lenses arrangement (in fact a Galilean telescope). The beam expansion is 6 times for this laser ( focal length -25mm for concave lens and +150 mm for convex one). The focusing of this device is as good as the preceding one made with a spatial filter equiped with 2 microscope objectives. It has the advantage to keep laser focusing into the image plane of the microscope. Green laser from aixiz_lasers. 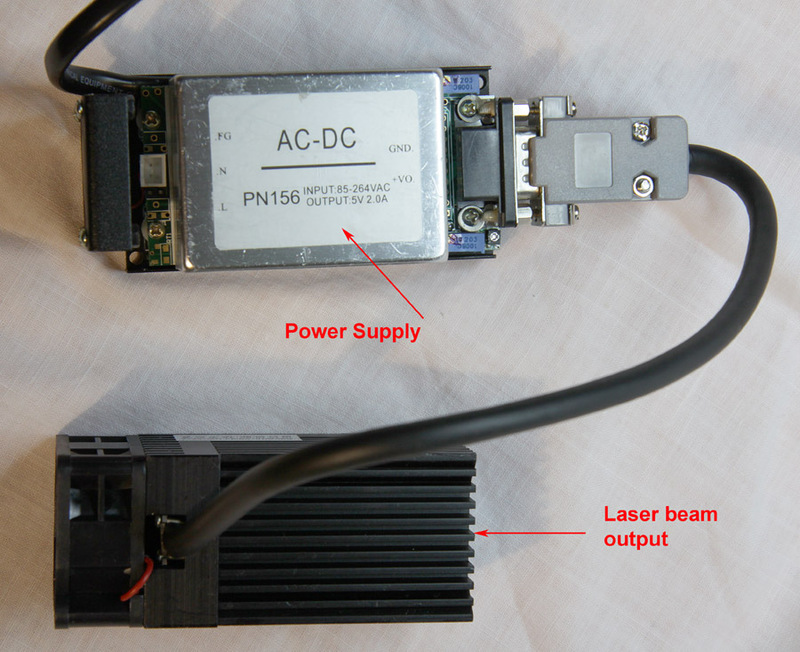 It is a low cost laser probably of Chinese origin although nothing indicated on the unit. The power rating is 200mW adjustable. I have reduced the power for Raman application. Moreover, the light intensity can be further reduced with the addition of neutral density filters at laser output to avoid the destruction of sensitive samples. A home made illumination system can be attached and removed from the green laser port . The light element is a LED array, 9 mm diameter with a light flux of max 1500 lumens adjustable by a variable current supply. This illuminator is used to examine the sample in a reflection mode and thus choose the right position for Raman measurement. 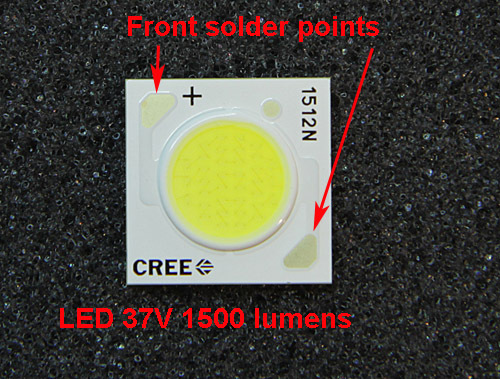 View of the LED array, color temperature: 6500 K. This unit can be soldered from the front side. Its back side is mounted on a heat sink.